Twenty-year-old Sam Curran has become the youngest Englishman in a century to be named as one of Wisden’s five Cricketers of the Year. The all-rounder was named alongside his international team-mates Jos Buttler and Rory Burns. England batter Tammy Beaumont and India captain Virat Kohli complete the list. Kohli was also named the leading cricketer in the world, while compatriot Smriti Mandhana was the world’s leading women’s cricketer. Afghanistan’s Rashid Khan was named the world’s leading Twenty20 cricketer for a second year running. Excluding 1918 and 1919 when schoolboy cricketers were honoured after the end of World War One, only Jack Crawford, who was 19 when he was named as one of the five leading cricketers in 1907, was a younger recipient than Curran. The Cricketer of the Year award can only be won once by a player in their career and is based on performances in the English summer. 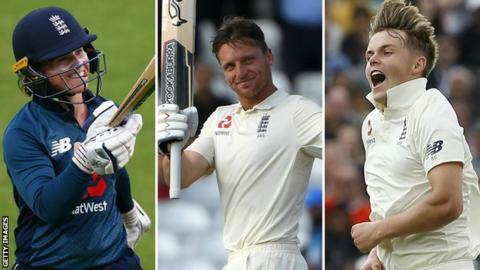 The Cricketers of the Year – who won & why? Both Burns and Curran made their Test debuts in 2018, as well as helping Surrey to win their first County Championship title since 2002. Curran scored 272 runs and took 11 wickets to be named man of the series in England’s 4-1 win over India in September. Opening batsman Burns, who captains Surrey’s red-ball side, was the Championship’s leading run-scorer and subsequently made his England Test debut. Buttler returned to England’s Test side in the summer and made his first century, as well as scoring 336 runs in England’s 50-over whitewash of Australia. He has scored more runs than any other England Test player since his recall in May 2018 and is vice-captain in all formats of the game. Opener Beaumont hit the fastest T20 century by an England women’s player in June when she reached three figures from just 47 balls. She averaged 50.22 from nine one-day internationals in 2018, and made back-to-back centuries against South Africa during the summer. India’s prolific batsman Kohli, who was named Leading Cricketer for the third successive year, scored 2,735 runs across all three formats in 2018 – more than 700 more than his nearest rival, Joe Root. During that period he scored 11 centuries in 37 innings and ultimately led India to their first Test series victory in Australia. England’s leading Test wicket-taker James Anderson and leading run-scorer Alastair Cook – who retired from international cricket in 2018 – are on the front cover of the 156th edition of the Wisden Almanack.